This area at the base of Mars' Mount Sharp includes a pale outcrop called "Pahrump Hills," which NASA's Curiosity rover investigated from September 2014 to March 2015, and a route toward higher layers of the mountain called "Artist's Drive." NASA's Mars rover Curiosity is back in action for the first time after suffering a glitch late last month. The 1-ton Curiosity rover transferred powdered rock sample from its robotic arm to an analytical instrument on its body on Wednesday (March 11), and then drove about 33 feet (10 meters) toward the southwest on Thursday (March 12), NASA officials said. Curiosity had been stationary since Feb. 27, when it experienced a short circuit while attempting to transfer the sample, which the rover had collected from a rock dubbed Telegraph Peak. "That precious Telegraph Peak sample had been sitting in the arm, so tantalizingly close, for two weeks. We are really excited to get it delivered for analysis," Curiosity Project Scientist Ashwin Vasavada, of NASA's Jet Propulsion Laboratory in Pasadena, California, said in a statement. Engineers have spent much of the past two weeks trying to figure out exactly what caused the short circuit. Testing suggests that it originated in the percussive mechanism for Curiosity's arm-mounted drill (which hammers as well as rotates to bore into rock). The rover team will continue their analyses to determine how to proceed with future drilling work, NASA officials said. Curiosity has performed six sample-collecting drilling operations since landing on Mars in August 2012. Analysis of some of these samples has helped rover scientists determine that the Red Planet could have supported microbial life in the ancient past. 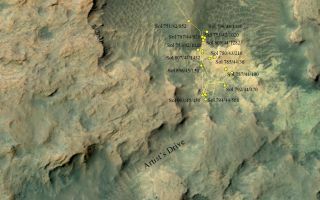 Curiosity is moving away from an outcrop at the base of the towering Mount Sharp called Pahrump Hills, which the six-wheeled robot has been studying since last September. Curiosity will head to higher ground on Mount Sharp, via a valley called Artist's Drive. "Road to Wellville: In good health, doing science & heading higher on Mt Sharp," NASA officials said Thursday via Curiosity's official Twitter account, @MarsCuriosity. Mount Sharp has been Curiosity's prime science destination since before its November 2011 launch. The rover's handlers want Curiosity to climb up through the mountain's lower levels, reading a history of Mars' changing environmental conditions as it goes. Curiosity transferred some Telegraph Peak powder to its Chemisty and Mineralogy instrument, or CheMin, on Wednesday. The rover will also deliver some of the sample to its Sample Analysis at Mars (SAM) instrument soon, NASA officials said.